Lee and Ryu reported based on the global occurrence data during the last 10 years, the incidences and maximum OTA level in raw cereal grains were 29% and 1.164 μg/kg. Kolakowski et al. tested 6857 cereal-based, fruit-based, and soy-based food samples for OTA in the Canadian retail market from 2009 to 2014. They reported that 47% (3200) of the samples did not contain detectable concentrations of OTA and 53% (3657) of the samples contained OTA at 0.040–631 ng/g. Wheat, oats, milled products of other grains (such as rye and buckwheat), and to a lesser extent corn products and their derived foods were the most significant potential sources of OTA exposure for the Canadian population. In 2004–2007, OTA was tested in 1358 samples in retail foods in Japan. OTA was detected in wheat flour, pasta, oatmeal, rye, buckwheat flour and dried buckwheat noodle, raisin, wine, beer, coffee bean and coffee products, chocolate, cocoa, and coriander samples. OTA was found in more than 90% of the samples of instant coffee and cocoa, and the highest concentration of OTA, 12.5 μg/kg, was detected in raisin samples. In recent years, OTA has become an important topic for the Institute of Standards and Industrial Research of Iran (ISIRI). By determining ranges of OTA contamination in foods and beverages, OTA exposure can be estimated from the known intake levels of the specific foods in Iran population. However, the accuracy of this estimation is limited due to the major variability in OTA content in foods, as well as difference in dietary habits. Therefore, the aim of this study was to review the evidence of OTA in various foods and beverages in Iran. 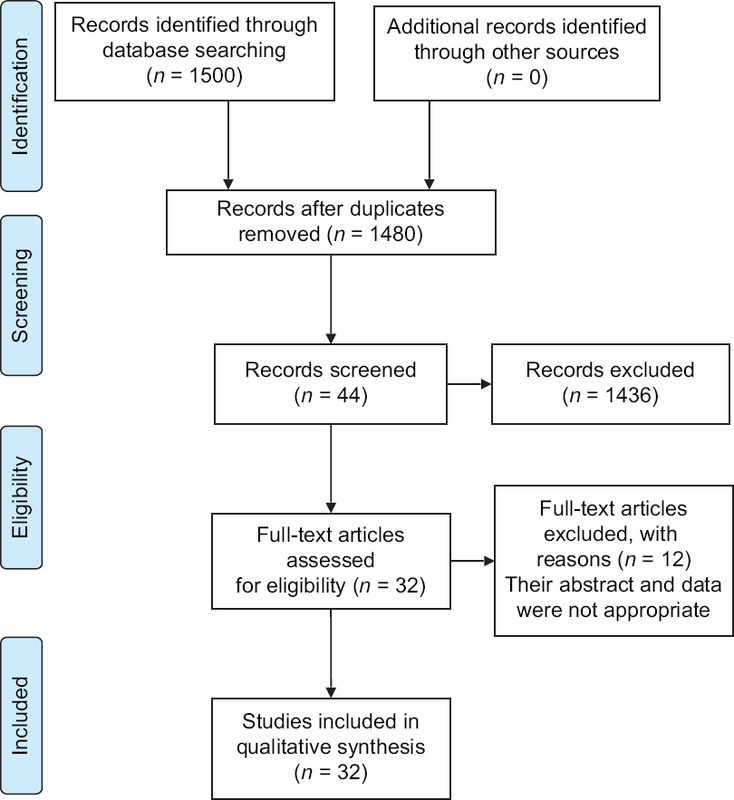 In this review, we searched both local and international databases, such as ISI Web of Knowledge, the Cochrane Database of Systematic Reviews, PubMed, Scopus, Google Scholar, Magiran, Iran Medex, Irandoc, and SID. The manuscripts selected from the studies were aimed to cover the presence and levels of OTA in various foods according to their title and/or abstract of the manuscripts selected by the search with no language restriction. The search terms were used without restriction included combinations of: “Iran,” “ochratoxin A,” “spices,” “cereals,” “beverages,” “meat,” “milk,” “bread,” “dried fruits,” “food contamination,” “HPLC,” “ELISA.” In addition, we searched reference lists from retrieved manuscripts and looked up ochratoxin review papers. Our search was limited to manuscripts published ranging from 2000 to 2016. Being conducted in Iran was considered as the inclusion criteria while exclusion criteria were manuscripts that were not in Iran, were published before 2000, conducted on toxicity and other subjects' OTA, and lack of information on the validity parameters and accuracy in the analytical methods such as limit of detection (LOD), limit of quantification, and recovery [Figure 1]. In these papers, high-performance liquid chromatography (HPLC), enzyme-linked immunosorbent assay (ELISA), liquid chromatography-tandem mass spectrometry (LC-MS/MS), inverse ion MS, and carbon paste electrode chemically modified with gold nanoparticles as reliable methods were used for detection and quantitation of OTA in various foods. Results were reported only based on place, source, mean concentration (μg/kg), maximum concentration (μg/kg), minimum concentration (μg/kg), method, and excess infection OTA in various foods. Thirty-two bibliographic records in relevance to the ochratoxin of various foods in Iran were identified based on information in the title, abstract, and reference lists in these selected studies. Almost all studies on cereals and nuts in Iran have shown OTA contamination., Hadian et al. showed that all 100 tested imported and domestic rice samples were contaminated with OTA at a mean level 1.37 ± 5.72 μg/kg. The OTA level in 3% of domestic rice samples was higher than the Iranian national standards. OTA was detected in rice samples in Isfahan,, Shahrekord, Mazandaran, Gillan, Tehran and Khuzestan, Urmia, and Tehran  with the minimum and maximum amounts of OTA concentrations 0.2 μg/kg and 11.54 μg/kg. Mahtabani et al. showed that OTA was not found out of 18 breakfast cereal samples. The result for 3 breakfast cereal samples was collected from Kerman, showed that the mean OTA amount (0.48 μg/kg) was lower than European Commission (3 μg/kg). In the study, wheat flour samples of 4 factories in Ahvaz were collected and analyzed using HPLC method. Thirty (93.75%) out of 32 samples were contaminated with OTA, at concentration ranging from 0.004 to 0.809 μg/kg, with an average of 0.09 μg/kg. All of the samples had lower levels of OTA than 5 μg/kg assigned by the standards. In one study, all 6 salted pistachio, 6 raw pistachio, 12 hazelnut, 12 almond, and 12 walnut samples were not contaminated with OTA. Beheshti and Asadi detected OTA content in 100 grain and derived product samples by high-performance liquid chromatography with immunoaffinity column cleanup and fluorometric detection. OTA was found in 32% of green gram, 13.3% of chickpea, 10% of lentil, and 17.5% of wheat flour samples. All contaminated samples had an OTA level lower than the maximum limit of OTA according to standards [Table 3]. An investigation of 40 currant, 16 sultana, and 10 raisin samples from Hamadan showed that 23 (57.5%) currant, 10 (62.5%) sultana, and 6 (60%) raisin samples, respectively, were contaminated with OTA using the HPLC method. However, 5 (7.6%), 3 currant and 2 sultana, samples had higher concentrations than the maximum limit of OTA according to national standard of Iran (5 μg/kg). However, none of the samples had higher OTA than the maximum limit of OTA according to European Commission (10 μg/kg). Shakerian et al., using ELISA method, showed that in 3.1% of the 80 analyzed samples from Isfahan had an average OTA concentration of 3.73 ± 2.27 μg/kg. The incidence rates of OTA contamination in dried coconut and slices of quince samples were 10.0% and 5.6%, respectively. Furthermore, OTA was not found in sour cherry, slices of peach, and pineapple samples. The concentration of OTA in any of contaminated dried fruit samples was not higher than maximum tolerance limit accepted by the European Commission (10 μg/kg). Dried apricot and prunes samples were tested for OTA by Janati et al. OTA was found 3.33% of examined apricot samples and 20% of examined prunes samples more than 0.2 μg/kg. Furthermore, OTA was detected in several dried vine fruit samples such as raisin,, fig,, and date [Table 3]. Consumption of soft drinks based on dietary recommendations in Iran is decreasing. While the consumption of nonalcoholic beers as nutritive beverages is increasing. One study showed that out of 35 local and 35 imported malt beverage samples from Tabriz, all of the samples were contaminated with OTA. The average OTA concentrations in local and imported samples were 96.04 ± 126.13 and 60.71 ± 47.82 ng/kg, respectively, and the difference was not statistically significant. No significant difference was observed between different brands contamination. Furthermore, the OTA levels of samples were under the maximum permitted level by European Commission. Afzali et al. used a carbon paste electrode chemically modified with gold nanoparticles as a sensitive electrochemical sensor for determination of OTA. They have shown that this method has been applied to the determination of OTA in cereal-derived products such as beer samples. The minimum and maximum amounts of OTA concentrations in beer samples were 4.13 and 6.11 nM, and OTA levels in beer samples were below the maximum limit permitted by the European Commission. In this study, three studies were examined regarding OTA concentrations in grape and concentrated grape juices. Khiabani and Sani showed that 12 samples (60%) of 20 tested concentrated grape juice samples collected from retail stores of 9 cities in Khorasan province had an average OTA concentration of 0.6 ± 0.71 μg/kg which was lower than EU standards (2 μg/kg). The maximum and minimum concentrations of OTA in the samples were 0.24 and 1.74 μg/kg. Ghafari et al. reported that only one sample (1.2%) of 40 red grape juice samples contained OTA (1.6 μg/kg) which was below the maximum tolerance accepted by the European Commission (5 μg/kg). OTA was not found in white grape juice samples. However, in a previous study, 32 grape juice samples, out of 100 samples examined, contained OTA above the European Commission (10 μg/kg) with the average 8.14 μg/kg. In this study, two studies were examined regarding OTA concentrations in human milk samples. Afshar et al. showed that of a total 136 human milk samples tested using HPLC, only two were contaminated with OTA, at 90 and 140 ng/L. While samples tested using ELISA, five were contaminated with OTA, at ranged between <5 and 16.42 ng/L. They reported that the occurrence of OTA contamination in human milk samples in Sari (northern Iran) was low. A study by Dehghan et al. showed that 84 samples (96.6%) of 87 human milk samples from Khorrambid (southern Iran) had OTA levels at a mean level of 24.57 ± 13.6 ng/kg. According to the European Union Standard, 14 (16%) positive samples revealed more than the maximum limit of 40 ng/kg for ochratoxin (range, 1.6–60 ng/kg). OTA was detected in two baby food samples in Kerman; all of the samples had toxin levels lower than European Union regulations (0.5 μg/kg). The mean OTA concentration of baby food samples was 0.075 μg/kg. Spices including variety of seeds, fruits, and roots or other plant substances primarily are used for flavoring, coloring, and preserving foods. A study cited by Salari et al. to compare HPLC and ELISA methods for OTA determination in red pepper samples showed a good correlation between ELISA and HPLC methods for detection of OTA (r2 = 0.947). Based on their results, ELISA can be used as a reliable screening method, but the confirmation of positive results must be done by HPLC method. ELISA and HPLC detected OTA in 8 (22%) and 6 (16.7%) samples within the range of 0.59–2.35 and 0.74–2.17 μg/kg, respectively. Jalili reported that out of 92 spice samples from different markets in Tehran, 29 samples (31.5%) were contaminated with OTA ranged from 0.45 to 18.64 μg/kg. Occurrence of OTA contamination in red pepper and cinnamon samples was significantly higher than in black pepper and turmeric samples. The maximum OTA level was detected in a red pepper sample (18.64 μg/kg) [Table 3]. In this investigation, only one study was examined regarding OTA concentration in licorice root sample. Khalesi et al. reported that amount of OTA in the licorice root sample was 8.8 ± 0.6 μg/kg, using inverse ion mobility spectrometry. The mold growth and production of OTA are related to several factors including temperature, moisture, and water activity during the harvesting, drying, storage, process and distribution of the crops. For inhibition of fungous growth on grains and dried fruits, it is necessary to dry them fast and wholly and maintain them on dry place. Cereals such as barley, wheat, rice, corn, green gram, chickpea, and lentil are very susceptible to fungal attacks while in the field and during storage. Rice and wheat flour are the most important staple food crops in the diet of many people in Iran that are used in food products such as breads, cakes, and biscuits., Furthermore, certain nuts such as pistachio, almond, hazelnut, and walnut are common in Iran. This review demonstrated that almost unprocessed and processed cereals and nuts were contaminated with OTA. Rahimi et al. analyzed 86 bread samples for OTA contamination, and the detection rates in autumn, winter, and spring, respectively, were 53.6%, 50%, and 46.2%, at 3.02, 2.52, and 2.27 μg/kg. Seasonal evaluation of the data did not indicate a significant difference in contamination levels. Dried fruits are fruits that are produced by removing the moisture content, through traditional sun drying or artificially drying. Today, dried fruits such as date, apricot, peach, fig, and raisin consumption is widespread in Iran. Dried fruits as nonperishable foods can support growth of molds and produce of mycotoxins such as OTA. In the conducted studies, the highest rate of the contamination with OTA was in raisin, fig, and dried quince and coconut samples. However, the most contaminated samples had OTA levels lower than the Iranian national standards and European Union regulations. A previous study showed that apparent quality of raisin samples, defective seed percentage, was not significantly correlated with the amounts of OTA  while Mirabolfathi et al., showed that the highest contamination with OTA was found in injured not directly edible raisin samples. We can use food processing to reduce OTA exposure by destruction or removing OTA, transforming them into less toxic derivatives and adsorbing OTA to chelating agents. Some processing techniques, especially physical treatments such as sorting, sieving cleaning, flotation and density segregation, washing, dehulling, steeping, milling, heat treatment, and mycotoxin binder, have been in use for a long time., A previous study demonstrated that roasting can reduce OTA levels in coffee beans up to 97%. Heat treatment can reduce OTA toxicity due to degradation of OTA to 14-(R)-OTA, 14-decarboxy OTA, and OTA alpha amide. However, OTA is generally stable at temperatures ued during ordinary cooking. Chemical methods and food additives can be used to reduce OTA. Ammoniation decreases OTA levels in maize, wheat, and barley after treatment with 2% aqueous NH3. Chemical agents such as formic, propionic, and sorbic acids, H2O2, and sodium hypochlorite have been shown to degrade OTA. Furthermore, microbes such as Saccharomyces cerevisiae and their enzymes can be able to detoxify OTA, including carboxypeptidase, chymotrypsin, and lipases. Antioxidant and antimicrobial agents such as extracts and essential oils of medicinal plants, melatonin, N-acetylcysteine, and reducing sugars could reduce the toxicity of various agents including mycotoxin and also have protective role.,, Therefore, the factors that may increase the antimicrobial and antioxidant capacity of the food products should be more investigated. OTA causes serious public health hazard due to consumption of contaminated food. This study carried out in different regions and provinces of Iran has demonstrated that almost all various food samples had the levels of OTA. Nevertheless, the results showed that the most contaminated samples had OTA levels lower than the Iranian national standards and European Union regulations. Anyway, farm management and food storage practices as a part of Hazard Analysis and Critical Control Points (HACCP) in critical points on foods chain are the most effective approaches for reducing ochratoxin. Finally, it is suggested that extensive researches identify more effective processing techniques that can be used safely for decreasing OTA in foods, especially effects of extracts and essential oils from medicinal plants. Furthermore, it is offered that human risk is assessed for OTA in each food. There are no conflicts of, interest. Fapohunda SO, Negedu A, Okeke OF, Fapohunda T, Wahab MK, Okeke F. Ochratoxins – A review. Basic Res J Agric Sci Rev 2014;3:105-15. Heussner AH, Bingle LE. Comparative ochratoxin toxicity: A Review of the available data. Toxins (Basel) 2015;7:4253-82. Malir F, Ostry V, Pfohl-Leszkowicz A, Malir J, Toman J. Ochratoxin A: 50 years of research. Toxins (Basel) 2016;8. pii: E191. Gholampour AE. Evaluation of the presence of ochratoxin in grape juices and raisins. J Food Technol Nutr 2012;9:95-101. Mirabolfathi M, Karami R, Hoseinian L. Ochratoxin A and ochratoxin-producing isolates of Aspergillus section nigri in raisin in Iran. Iran J Plant Pathol 2014;50:1-16. Ochratoxin A. IARC Monogr Eval Carcinog Risks Hum 1993;56:489-521. Benford DB, Dekant W, Fuchs R, Gaylor DW, Hard G, McGregor DB, et al. Ochratoxin A. In: Safety Evaluation of Certain Mycotoxins in Food, Proceedings of the 56th Meeting of the Joint FAO/WHO Expert Committee on Food Additives (JECFA). Vol. 47. Geneva, Switzerland: World Health Organization; 2001. p. 281-7. Health Canada. Summary of comments received as part of Health Canada's 2010 call for data on ochratoxin A. Bureau of Chemical Safety, Food Directorate, Health Products and Food Branch. Ottawa, ON, Cannada; 2012. Available from: http://www.hc-sc.gc.ca/fn-an/consult/limits-max-seuils/myco_ochra-2012-summary-resume-eng.php. [Last accessed on 2016 Feb 02]. 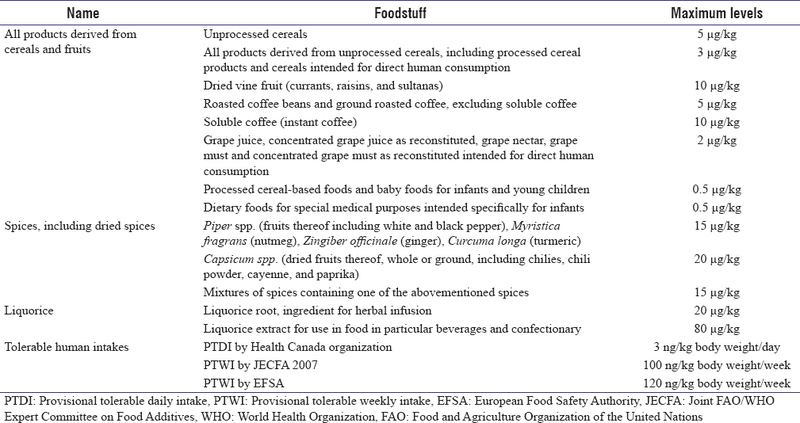 European Food Safety Authority (EFSA). Opinion of the scientific panel on contaminants in the food chain on a request from the commission related to ochratoxin A in food. EFSA J 2006;365:1-56. Lee HJ, Ryu D. Worldwide occurrence of mycotoxins in cereals and cereal-derived food products: Public health perspectives of their co-occurrence. J Agric Food Chem 2017;65:7034-51. Kolakowski B, O'Rourke SM, Bietlot HP, Kurz K, Aweryn B. Ochratoxin A concentrations in a variety of grain-based and non-grain-based foods on the Canadian retail market from 2009 to 2014. J Food Prot 2016;79:2143-59. Aoyama K, Nakajima M, Tabata S, Ishikuro E, Tanaka T, Norizuki H, et al. Four-year surveillance for ochratoxin a and fumonisins in retail foods in Japan. J Food Prot 2010;73:344-52. Institute of Standards and Industrial Research of Iran. Foodstuffs-Cereal and Cereals Products in Determination of Ochratoxin A by HPLC Method and Immunoaffinity Column Clean Up-Test Method. National standard NO. 9238. 1st ed. Institute of Standards and Industrial Research of Iran; 2010. Rahimi E. The occurrence of ochratoxin A in rice in six provinces of Iran. Toxicol Ind Health 2016;32:1324-7. Rahimi E, Erfani M, Shakerian A. Frequency of ochratoxin A in bread consumed in Shahrekord. J Shahrekord Univ Med Sci 2014; 6:63-9. Hadian Z, Yazdanpanah Z, Azizi MH, Seyedahmaian F, Kooshki MR, Hosseini SM, et al. Occurrence of ochratoxin A in rice sold in chain stores in Tehran, 2007. Iran J Nutr Sci Food Technol 2009;2:53-9. Feizy J, Beheshti HR, Fakoor Janati SS, Khoshbakht Fahim N. Survey of ochratoxin A in rice from Iran using affinity column cleanup and HPLC with fluorescence detection. Food Addit Contam Part B Surveill 2011;4:67-70. Rahimi E, Jafarian M, Shakerian A, Kajbafi M. Contamination rate of ochratoxin A in rice on Isfahan retail market. J Food Hyg 2012;2:11-8. Ebadi Fathabad A, Tajik H, Aliakbarlo J, Mojaddar Langroodi A, Shariatifar N, Banikhademi S. Comparison and assessment of ochratoxin A in Iranian and imported rice. Sch J Agric Sci 2014;4:543-7. Nazari F, Sulyok M, Yazdanpanah H, Kobarfard F, Krska R. A survey of mycotoxins in domestic rice in Iran by liquid chromatography tandem mass spectrometry. Toxicol Mech Methods 2014;24:37-41. Mahtabani A, Bayat M, Hosseini SE, Aminafshar M, Tavakoli H. Assessment of ochratoxin A and aflatoxin B1, B2, G1, G2 rates in breakfast grains of supermarkets in Tehran using HPLC method in 2010. Hakim Res J 2011;14:10-5. Afzali D, Fathirad F, Ghaseminezhad S. Determination of trace amounts of ochratoxin A in different food samples based on gold nanoparticles modified carbon paste electrode. J Food Sci Technol 2016;53:909-14. Behfar A, Nazari Z, Heydari R. Identification and determination of ochratoxcin A concentration in wheat flour of flour factories in the Ahvaz city using HPLC. Sci Med J Ahwaz Jundishapur Univ Med Sci 2013;12:217-27. Nayebpoor F, Momeni M, Dehkordi FS. Incidence of ochratoxin A in raw and salted dried fruits using high performance liquid chromatography. Am Eur J Toxicol Sci 2013;5:1-6. Beheshti HR, Asadi M. Ochratoxin A in several grains in Iran. Food Addit Contam Part B Surveill 2013;6:200-2. Yazdanpanah H, Miraglia M, Calfapietra F, Brera C. Natural occurrence of aflatoxins and ochratoxin a in corn and barley from mazandaran and golestan in North provinces of I. R. Iran. Mycotoxin Res 2001;17:21-30. Mahdavi R, Khorrami SA, Jabbari MV. Evaluation of ochratoxin A contamination in non alcoholic beers in Iran. Res J Biol Sci 2007;2:546-50. Fakoor Janati SS, Beheshti HR, Khoshbakht Fahim N, Feizy J. Aflatoxins and ochratoxinin A in bean from Iran. Bull Environ Contam Toxicol 2011;87:194-7. Khalesi M, Sheikh-Zeinoddin M, Tabrizchi M. Determination of ochratoxin A in licorice root using inverse ion mobility spectrometry. Talanta 2011;83:988-93. Ghafari Z, Ghahfarokhi NK, Rahimi E. Presence of ochratoxin A in red and white grape juice commercialized in Iran. J Toxicol Sci 2011;3:228-30. Salari R, Habibi Najafi MB, Boroushaki M, Mortazavi S, FathiNajafi M. A comparison between ELISA and HPLC for aflatoxin B1 and ochratoxin A detection in Iranian red pepper. J Food Res 2012;21:481-91. Feizy J, Beheshti HR, Asadi M. Ochratoxin A and aflatoxins in dried vine fruits from the Iranian market. Mycotoxin Res 2012;28:237-42. Janati SS, Beheshti HR, Asadi M, Mihanparast S, Feizy J. Preliminary survey of aflatoxins and ochratoxin a in dried fruits from Iran. Bull Environ Contam Toxicol 2012;88:391-5. Rahimi E, Shakerian A. Ochratoxin A in dried figs, raisings, apricots, dates on Iranian retail market. Health 2013;5:41083. Shakerian A, Rahimi E, Nayebpoor F. Occurrence of ochratoxin A in some dried fruit products marketed in Iran. J Food Biosci Technol 2013;3:49-52. Afshar PS, Kalhori S, Babaee Z, Saravi SS. Occurrence of ochratoxin A and aflatoxin M1 in human breast milk in Sari, Iran. Food Control 2013;31:525-9. Heshmati A, Vahidinia A, Jafari M. Survey of ochratoxin A in raisin produced in Hamadan province factories and relationship between contamination with defective seeds. J Food Hyg 2013;3:33-41. Tavakoli H, Rostami H, Zabihi A, Bitarafan Z. A Survey of aflatoxins, ochratoxin and zearalenone contamination in imported and Iranian rice in Iran. World Appl Sci J 2014; 32:2119-22. Dehghan P, Pakshir K, Rafiei H, Chadeganipour M, Akbari M. Prevalence of ochratoxin a in human milk in the Khorrambid town, fars province, South of Iran. Jundishapur J Microbiol 2014;7:e11220. Heshmati A, Mozaffari Nejad AS. Ochratoxin A in dried grapes in Hamadan province, Iran. Food Addit Contam Part B Surveill 2015;8:255-9. Khiabani A, Sani AM. Ochratoxin A residue in grape juice concentrate. Int J Biol Pharm Allied Sci 2015;4:4874-81. Karami-Osboo R, Miri R, Javidnia K, Kobarfard F, AliAbadi MH, Maham M, et al. Avalidated dispersive liquid-liquid microextraction method for extraction of ochratoxin A from raisin samples. J Food Sci Technol 2015;52:2440-5. Jalili M. Natural occurrence of ochratoxin A contamination in commercial spices in Tehran. Nutr Food Sci Res 2016;3:25-30. Ha TH. Recent advances for the detection of ochratoxin A. Toxins (Basel) 2015;7:5276-300. Oliveira G, da Silva DM, Pereira RG, Paiva LC, Prado G, Batista LR. Effect of different roasting levels and particle sizes on ochratoxin A concentration in coffee beans. Food Control 2013;34:651-6. Bittner A, Cramer B, Harrer H, Humpf HU. Structure elucidation and in vitro cytotoxicity of ochratoxin α amide, a new degradation product of ochratoxin A. Mycotoxin Res 2015;31:83-90. Chełkowski J, Goliński P, Godlewska B, Radomyska W, Szebiotko K, Wiewiórowska M, et al. Mycotoxins in cereal grain. Part IV. Inactivation of ochratoxin A and other mycotoxins during ammoniation. Nahrung 1981;25:631-7. Karlovsky P, Suman M, Berthiller F, De Meester J, Eisenbrand G, Perrin I, et al. Impact of food processing and detoxification treatments on mycotoxin contamination. Mycotoxin Res 2016;32:179-205. Petruzzi L, Bevilacqua A, Baiano A, Beneduce L, Corbo MR, Sinigaglia M, et al. In vitro removal of ochratoxin A by two strains of saccharomyces cerevisiae and their performances under fermentative and stressing conditions. J Appl Microbiol 2014;116:60-70. Sharafati-Chaleshtori R, Shirzad H, Rafieian-Kopaei M, Soltani A. Melatonin and human mitochondrial diseases. J Res Med Sci 2017;22:2.